If you’re having trouble making visits to a grandparent with Alzheimer’s disease feel meaningful, you’re not alone. There are approximately 5 million Americans age 65 and over in the United States who have been diagnosed with this devastating disease. The severity varies, but can directly impact your loved one’s ability to interact with others – including their grandchildren. Creating quality time during visits can be a challenge, especially when grandchildren are young, and have difficulty understanding what’s happening to Grandma or Grandpa. A starting point for helping young ones understand Alzheimer’s is making sure you do as well, so here are a few of the basics to help you get started. Alzheimer’s disease is a disorder of the brain in which nerve cells are destroyed, leading to loss of memory, personality changes, and difficulty carrying on with normal daily activities. There are supportive treatment options available to help slow the progression of the disease and improve quality of life. Although research is ongoing, there is currently no cure. Alzheimer’s disease progress through a number of stages. Some experts describe seven stages, and some three stages. Generally, disease progression begins with no symptoms present, to increasing impairment of brain functioning, to a final stage of Alzheimer’s dementia. In this final stage, there is a loss of the ability to think, remember and reason normally. The severity of Alzheimer’s dementia varies as well. When it’s mild, it typically affects the person’s ability to function independently. When it’s most severe, the individual must rely on others to support all basic activities of daily living – such as hygiene and grooming, eating, bowel and bladder management, and mobility. So what are those 5 tips? Help grandchildren remember that Alzheimer’s is a disease, and that Grandpa or Grandma doesn’t have control over the things they may say or do – including whether or not they recognize loved ones or remember their names. It’s important for them to be given age-appropriate explanations, and there are some great resources available to help you do it. 2. Pull out the pictures. Old family pictures can provide a great focus of conversation, since individuals with dementia often have better long-term than short-term memory. 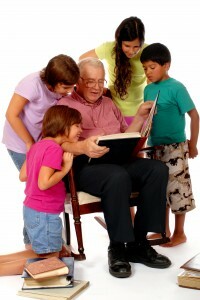 Using recent photos gets young ones involved, when they can share what’s happening at home and help put names to faces. Let grandchildren take part in labeling photos and creating a photo board or album that your loved one can see on a regular basis. 3. Turn on some music. Music is a powerful tool in the arsenal against dementia, and music therapy is often used in its treatment. According to Ronna Kaplan, M.A., Immediate Past President of the American Music Therapy Association, “…individuals with memory loss seem to ‘awaken’ when they experience music to which they have an emotional attachment.” There have been many instances of patients with memory and speech loss who suddenly perked up and began to reconnect at the sound of a favorite song. So put on some of your loved one’s favorites, and help grandchildren sing along. 4. Work on a scrapbook together. Scrapbooking is an effective tool to help both your loved one and a grandchild connect the present with memories of the past. According to Daniel Kuhn, author of Alzheimer’s Early Stages: First Steps for Family, Friends and Caregivers, “People with Alzheimer’s disease often don’t initiate activities or conversation on their own. Making scrapbooks draws them out. The photos serve as prompts for early memories and a chance to talk about the past.” It’s also a great way to help preserve your loved one’s life story, since you’ll increasingly be the keeper of family memories that can be cherished for years to come. 5. Let them help. It might seem like a good idea to shield children from the needs of others, but age-appropriate involvement helps them to feel important and your loved one to feel loved. Let them help with simple things like picking out an outfit, setting up a food tray, or combing Grandma’s hair. Giving them such responsibilities reminds them that they’re a valued part of the family; teaches them patience, love, and tolerance; and reminds them that you’re all in this together. There are many resources available for those affected by Alzheimer’s disease, such as the Alzheimer’s Association, their list of resources for parents and levitra reviews teachers, and the Alzheimer’s Foundation of America. A highly popular book related to this topic is Maria Shriver’s What’s Happening to Grandpa? Whatever activities you choose, remember to keep them simple, proceed at a pace that won’t overwhelm, and adjust to the needs of the day. Your loved one might have a very good day today and a very bad day tomorrow – something you can’t predict when you’re walking in the door with a grandchild in tow. Be prepared with a back-up plan if needed, and don’t promise a child something you can’t possibly guarantee. And if your best-laid-plans fall apart for the day, help a child remember that presence itself can be the most meaningful activity of all. If you would like to join us for blog posts & quarterly newsletters, we'd love to share them with you! If you would like to partner with us or would like more information, please contact us. Want to keep up with what's going on with us? Follow us across our Social Networks.